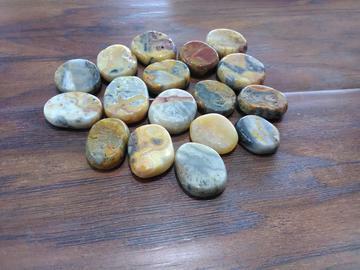 Bumble Bee Jasper is found in Australia. It is made of Arsenic, Sulfur, Hematite, Anhyolnte, and Volcanic Matter. Its coloring is usually yellow, orange, black, white, and grey. Bumble Bee Jasper activates the Sacral and Solar Plexus chakras, enabling you to accept change, find new opportunities, increase your self-esteem and make decisions without relying on emotions. Physically it helps with abdominal issues, allergies, and the nervous system.